Spider-Man: Into the Spider-Verse won the Academy Award for Best Animated Feature. Sony took a big gamble in putting out another Spider-Man project with a twist. However, the gamble paid off extremely well. Right from the start, the animated movie was praised for its unique look and feel. Co-writer Phil Lord said that the aim was to make a living comic book pop on the screen, and according to audiences, and now the Academy Awards, he and the crew pulled it off. Spider-Man: Into the Spider-Verse ended up beating Incredibles 2, Isle of Dogs, Mirai, and Ralph Breaks the Internet to get the Oscar for Best Animated Feature. The aforementioned titles were all worthy, but Spider-Verse pushed the boundaries of animation along with storytelling. Sony introduced the multiverse to the big screen and a whole lot of different versions of the iconic character, which has opened doors to tell a ton of other stories from the comic books, or at least take inspiration from. This is the first time in twelve years that a Disney movie has not taken home the Best Animated Feature award and the first time that Sony Animation has won in this specific category. Not only has Spider-Man: Into the Spider-Verse been praised for its animation, heart, and storytelling, but some fans have even deemed it to be the best comic book movie of all time. With that being said, the movie has been collecting awards left and right this awards season, including the Golden Globes, BAFTAs, Annies, Critic's Choice, and a ton more. Now, the movie is Academy Award winning, which throws a whole new level of praise on the project and everybody attached to making it come to life on the big screen. While it's exciting to see that Spider-Man: Into the Spider-Verse won the Best Animated Feature Oscar at The Academy Awards, it wasn't exactly surprising. The movie was the clear frontrunner this awards season and the buzz started well before the movie even hit theaters. The impressive marketing campaign showed off just enough to intrigue possible moviegoers while also showing off the unique visual style. From there, the studio started to introduce the different versions of Spider-Man that are included in the movie, which is when comic book fans started to get excited. 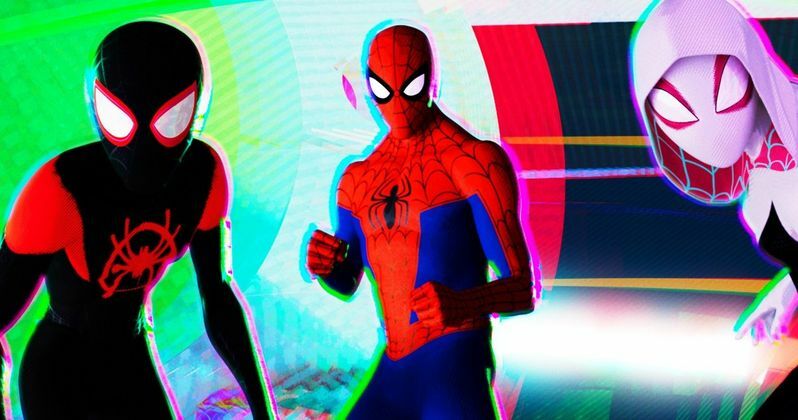 Spider-Man: Into the Spider-Verse threw in a ton of information from the comic book source material and then threw in a bunch of Easter Eggs too. One of the larger Easter Eggs in Spider-Man: Into the Spider-Verse was just discovered. As it turns out, there are numerous Stan Lee cameos hidden within the movie, some of which can only be found by slowing the movie down or pausing, which gives the Blu-ray release a huge bump. Fans are going to be watching the movie to find each and every Stan Lee cameo hidden within the project, which looks like it may be a daunting task. You can check out the rest of this year's Academy Award winners over at the official Oscars site.